The client informs me of the schedule that they need the work done by, then a mutually agreed deadline for the commissioned artwork is set and I begin the first stages of preparation. The client emails me as much information/details as possible about what they want for their illustrations. The more detail you can give the better, to ensure that my artwork will closely fit/align with your vision. Once I have received all materials, ideas, etc., from you, then I will begin the preliminary sketch. A typical rough sketch will take me about two weeks to complete. I will email you this preliminary sketch(es) as a watermarked low-res proof and any changes/alterations you want will be discussed and finalised at this stage before the final art is begun. If there are any changes to be made at this stage, I will produce more sketches/drawings incorporating these and email them to you. Only when you are 100% happy with the result, will the final art be started. 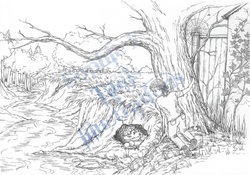 When you are satisfied with your preliminary sketch, I will start the final artwork and then send you a high-res watermarked proof of it when it is finished. This should take me about two weeks to complete. The whole process from beginning to end, should take about a month (depending on the number of illustrations wanted). Changes cannot be made to the artwork after the deadline/completion of the work. Once you, the client, receive the watermarked final illustration then payment will be made to me through PayPal*. Once I have received payment, you will receive the final artwork without watermarks and ready to use.